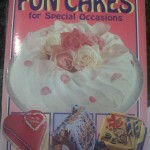 I found this adorable cake in the Family Circle Cookery Collection – Fun Cakes for Special Occasions. The cake was so cute that my son, Ryan (2) wanted me to make one for his third birthday. 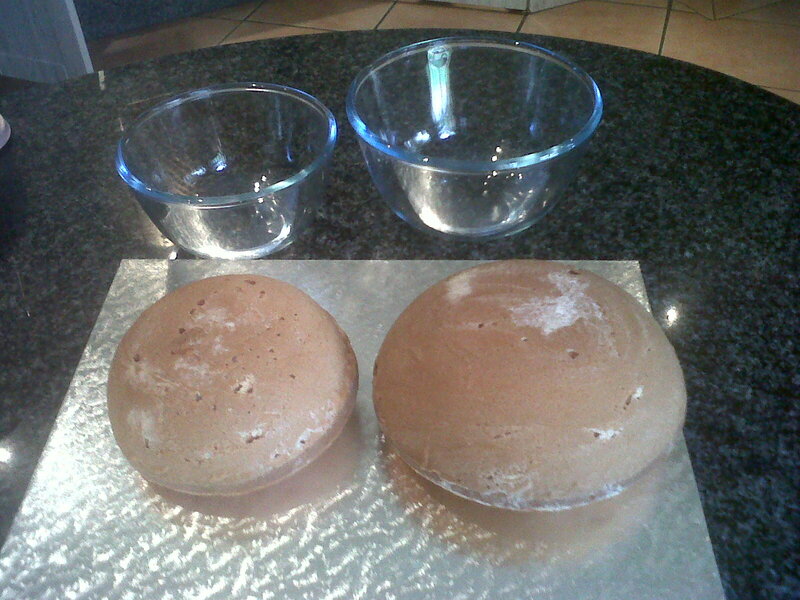 I baked a standard cake recipe and baked it in two Pirex bowls, one slightly bigger than the other. The bigger bowl would be the body and the smaller one the head. I coloured the dough pink for fun. 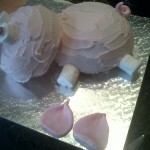 I put the two cakes off centre on the cake board so that the pig stands diagonaly on the board. 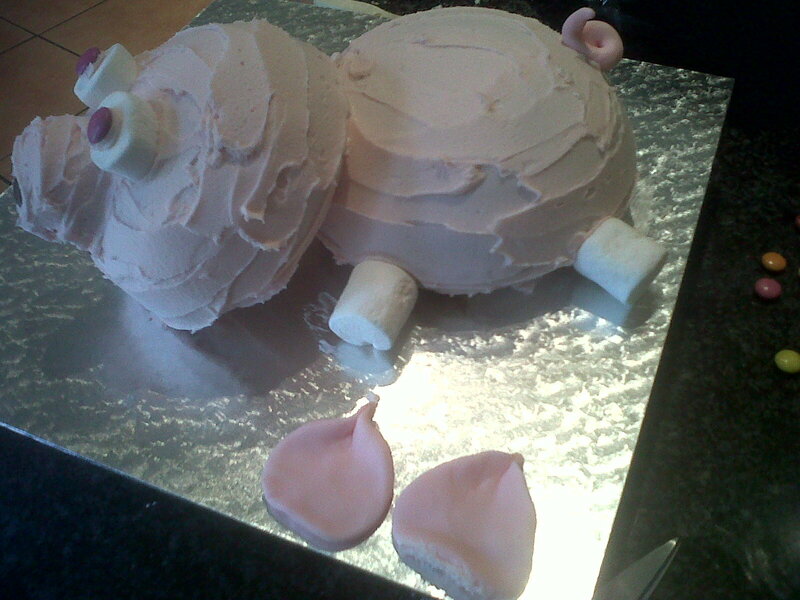 I used butter icing which I coloured light pink and covered the bottom of the body so that it stuck onto the board. Then I covered the top of the body. 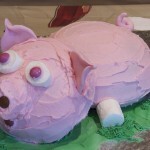 The bottom of the head is also covered in pink icing and secured at an angle to the body. 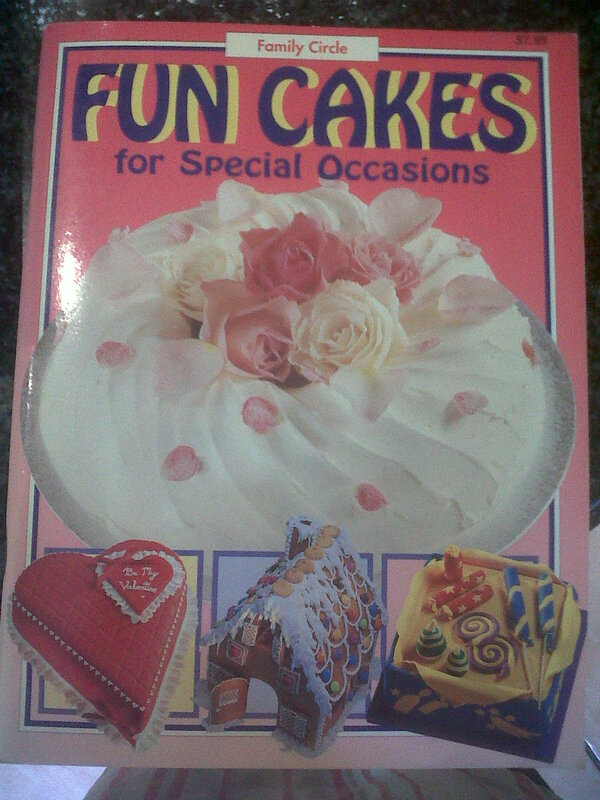 It is then covered completely in pink icing. 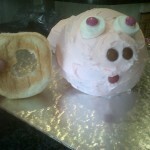 Next I had to make a pig snout. 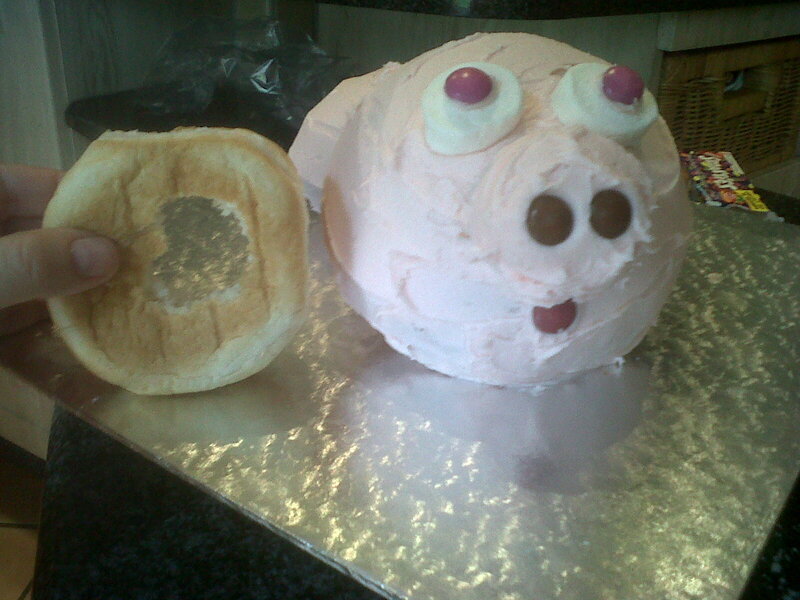 I didn’t have cake to use, so I cut out a circle from white bread, covered it with icing and stuck it onto the pig. Two brown Smarties competed the snout. I cut one white marshmallow into two pieces with scissors, and stuck onto the cake. Two pink Smarties competed the eyes. A red Smartie made a small mouth at the bottom. 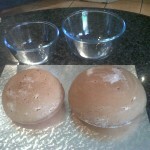 I fashioned a tail and two big pig’s ears from pink sugarpaste (with a little CMC glue in to make it stronger). The tail was inserted onto the “bum” of the pig. I had to leave the ears overnight to dry an harden. 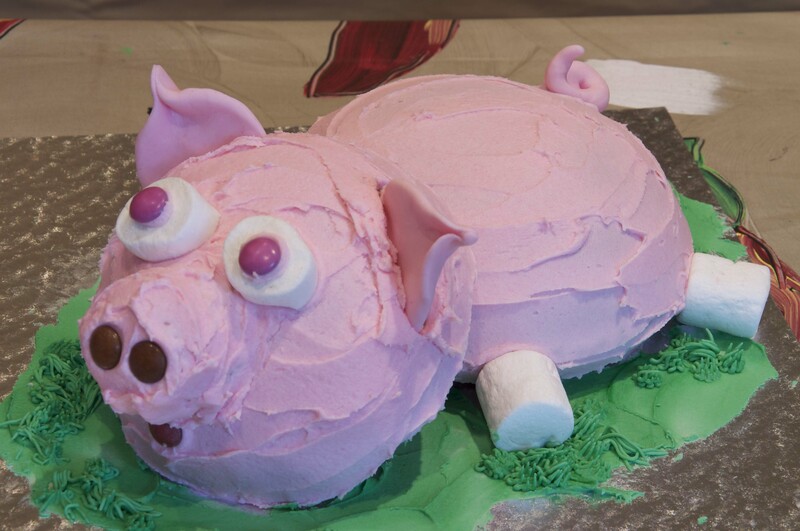 Four marshmallows created legs for the pig. I used white because I ran out of pink but pink would be better. 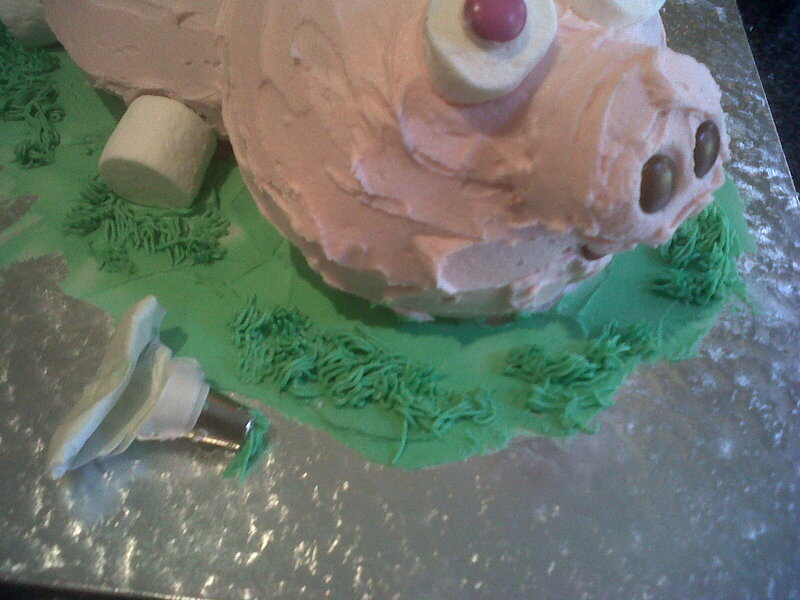 Next, I coloured the icing green and spread it around the pig to suggest grass. 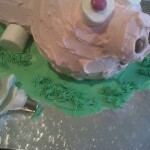 With a nozzle I created some grass around the pig. I have just finished a book called “Self Made Man” by Norah Vincent. This was a fascinating read about a women’s quest to see what it’s like to experience life as a man. She spent a year disguised as a man in order to learn more about what it’s like being a man in the western world. Norah Vincent wanted to get into the male psyche and immerse herself in the world where men rule supreme. She was expecting to experience the sense of power that comes from being an alpha male, having access to opportunities without having to apologise, and strutting around without fear. Although her insights after the year include the amazing feeling of belonging that she experienced as a member of a male group of friends (she joined a bowling league) the overall experience of being a man was quite different from her expectations. She basically realised that most men live a life filled with fear and pain! Fear, because they are constantly scrutinised by themselves and others for any sign of weakness. This could take the form of emotional weakness (showing sadness or compassion) or physical weakness (being unable to throw a bowling ball, for example.) Weakness in a man (as opposed to vulnerability in women) does not engender sympathy from other men. It makes them feel embarrassed for you and sometimes even lead to vicious attacks – whether verbal or physical. It seems that, as a man, you have to be on top of your game all the time. You cannot be sad, emotional or just not good at something. The culture doesn’t tolerate it. Most men live in pain because they’ve been taught – no, forced – not to show emotion. Boys don’t cry, remember? Even young boys are taught that they have to show no emotion when they are in pain, and with enough time, they unlearn the skill of talking and sharing their emotions. The effect is that most grown men are unable to “feel” emotion in any true sense. This has the result of imprisoning them in a cold and lonely state where the only emotion they can share without fear of being ostracised, is anger. And, according to Norah, there is a LOT of angry men out there. Wow. This really scared me. As a woman, I am used to having good cry when I feel the need to. I can show love and affection to my husband and children (two boys) without fear of being rejected or seen as a “sissy”. Even my relationships with other women is characterised through physical touch (hugs and kisses) as well as sharing our most intimate feelings easily. In fact, the thought of not giving outing to my feelings is a frightening one. What do you do with all those bottled-up emotions if you don’t have the cultural option of letting them out?! I worry about how I will raise my boys in this cultural paradigm. I want them to be happy – any mother does – but I also want them to fit in. The two are closely related, aren’t they? But the dichotomy is that they also seem to be mutually exclusive. You can only be happy in yourself if you have a healthy emotional life. That means feeling and showing emotions freely. But in a culture that frowns on any show of vulnerability in men, it means that you’ll have to curb those emotions that are “unacceptable” – leading to unhappiness. Part of the same equation is fitting in with what the group expects from you. We’ve all experienced the pain of being in a group where we don’t fit in. So, how are you a healthy emotional human being but also fit in with the male culture where the only emotion that carries any value is anger? A true catch 22. I don’t have the answer. I try to ensure that my children (5 and 2 respectively) are in touch with their emotions. When they cry, I ask them why they are sad. I try to convey the message that it is ok to cry when you are in pain – either physical or emotional. I try not to tell them that I’m proud of them for not crying – something that is surprisingly difficult! I took my 5 year old to the doctor the other day for a painful spider bite. Afterwards I was horrified to hear myself telling him that I’m proud of him for not crying! It just showed me how deep the “boys don’t cry” belief goes in my own paradigm. In future I will tell him that I’m proud of him for showing emotion in an honest way. If we are going to change the paradigm that showing male emotion is ok, we have to start with our children. Show them that emotions are acceptable, whether it is mad, sad, glad or bad! Talk about feelings and encourage them to really feel. More importantly, encourage the male role models in their lives to show it too. My husband is brilliant at that. He shows his boys that it’s acceptable to hug and kiss, and he holds them tightly when they cry. It warms my heart every time I see it. That’s how you change the world.